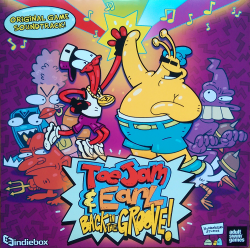 ToeJam & Earl: Back In The Groove Original Game Soundtrack! / ToeJam & Earl: Back In The Groove Original Game Soundtrack! / ToeJam & Earl: Back In The Groove Original Game Soundtrack! ToeJam & Earl: Back In The Groove Original Game Soundtrack! 2LP set on red and orange vinyl. Also includes the soundtrack on CD and digital download, and includes an art book.